The Paintshop Hostel is the 1ST and BEST hostel in Figueira da Foz (as voted by guests), created by Backpackers for Backpackers. Recently voted in the Top 8 Hostels in Portugal and Top 20 Hostels in Europe (Buzzfeed 2017) we've got everything you need for a comfortable and fun stay on this popular Atlantic surf & seaside resort. We're proud to offer guests a fully equipped kitchen, DVD lounge, comfy beds, hot & powerful showers, fully-stocked sports bar, beer garden, internet cafe, bike rental, laundry facilities and free parking. 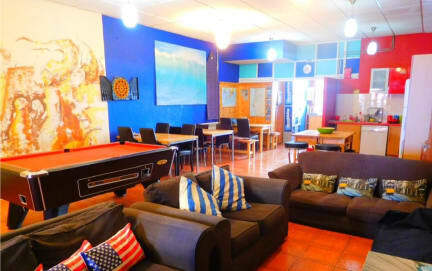 The Paintshop Hostel has become well-known for its friendly welcome, laid back atmosphere, relaxed and homely vibe, excellent facilities and easy access to the local surf and night spots! Close to all the restaurants, nightlife, casino, and Europe's widest beach, Figueira da Foz is the perfect place to break the journey between Porto and Lisbon. 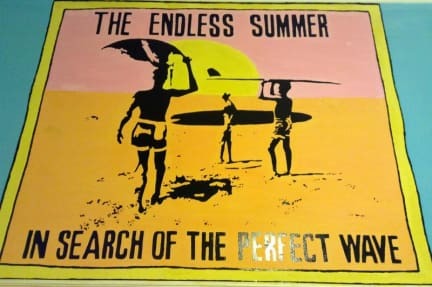 Lovingly created with the Traveller and Surfer in mind, the Paintshop Hostel offers great value accommodation with a choice of private rooms and mixed dorms. All prices include free delicious buffet breakfast every morning (just becuase we care) & free WiFi! The Paintshop Bar and Beer Garden is private for our guests and a great place to kick back after a long day at the beach and make new friends. We will be showing all 2018 World Cup Football Games live on our Big Screen TV this year. Give yourself a night off from cooking and join us for our legendary Pizza Night (Mondays) and BBQ Night (Wednesdays). If you feel like staying in and relaxing we have heaps of DVDs, free popcorn, and satellite TV. We have an internet cafe where you can surf the net, charge your iPod, upload your photos, print your boarding passes and plan the rest of your travels. There's a pool table in the hostel too and a book exchange...so grab a book to take to the beach or for any long journey ahead. Figueira da Foz is a Surfers Paradise - with uncrowded beaches and surf breaks along the Silver Coast. Here at the Paintshop Hostel we provide surfboard & wetsuit rentals for our guests and surf lessons with qualified local surf instructors. Warning - 1 night will not be long enough!! PLEASE NOTE: We do not have credit card facility at the Paintshop.